A visit to the vet is certainly not at the top of your dog’s list of favourite things to do. In most cases, going to the vet is a very stressful and embarrassing event for your pup. For this reason, preparing your dog for a medical appointment should be about limiting his tension and anxiety. The first visit to a vet – what does it look like from a dog’s perspective? Your dog’s first visit to the vet is a day that is likely to linger in his memory for a long time, for it frequently a huge challenge. Most dogs react with serious distaste when it comes to veterinary consultation. In order to minimize the fear that your dog experiences at the sight of a veterinary clinic, you should prepare him for the first visit as much as possible. A good initial impression is half the battle. You should try to help your dog develop a positive attitude towards vets and veterinary appointments. Remember that during consultation with a vet, your dog will face an environment that is fraught with the sights, sounds and smells of many other animals. For this reason, it is very possible for your dog to be triggered by a trip to the vet. It can happen even if every visit in the past went smoothly. Considering this, it is worth knowing how to properly prepare your pet for a meeting with the vet. In easy way you can protect him from unnecessary stress. If possible, the first thing to do when taking your dog to the vet is to arrange a consultation for a specific time. One of the most stressful components of a veterinary appointment is the time your dog spends in the waiting room. It is a place where your dog will often have to come across other animals who also feel uncomfortable. Waiting for a long time in this anxious atmosphere can really affect your pooch. 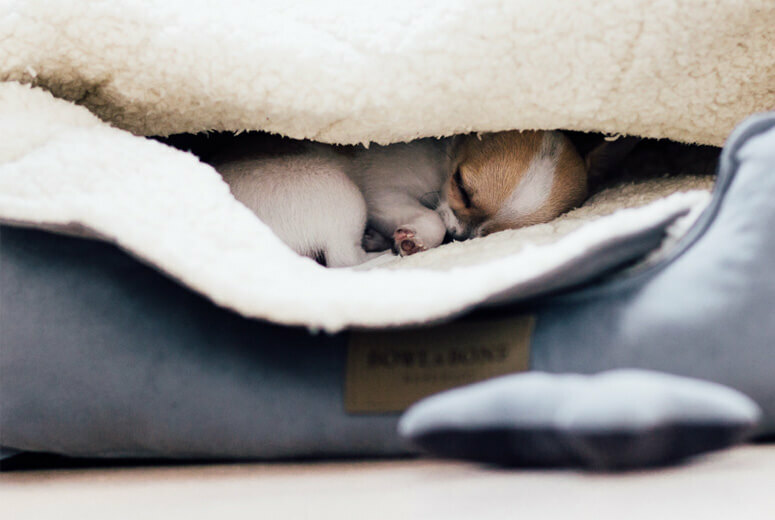 Before your first visit to the vet, make sure that your dog is rested and relaxed. You should also consult with a veterinarian and get to know if your dog should be fasting while testing. If your pup doesn’t need to fast, however, it is wise to make sure that he is not hungry before his appointment. What’s more, do not forget to take your dog’s favourite treats to the clinic. In the event of a stressful situation, it may be possible to distract your dog with goodies. Even if it is just for a moment. Most veterinarians also have treats in their offices. Nevertheless remember that bringing your own treats you will give your dog a taste from home that he loves and is familiar with. 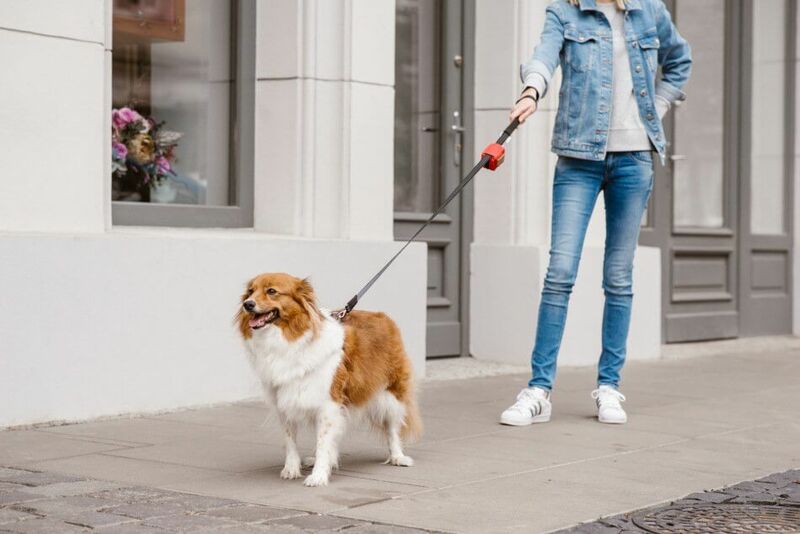 Giving your beloved dog his favourite treat after a successful visit to the vet is also an excellent way to end your appointment on a good note and create positive associations for your dog going forward. 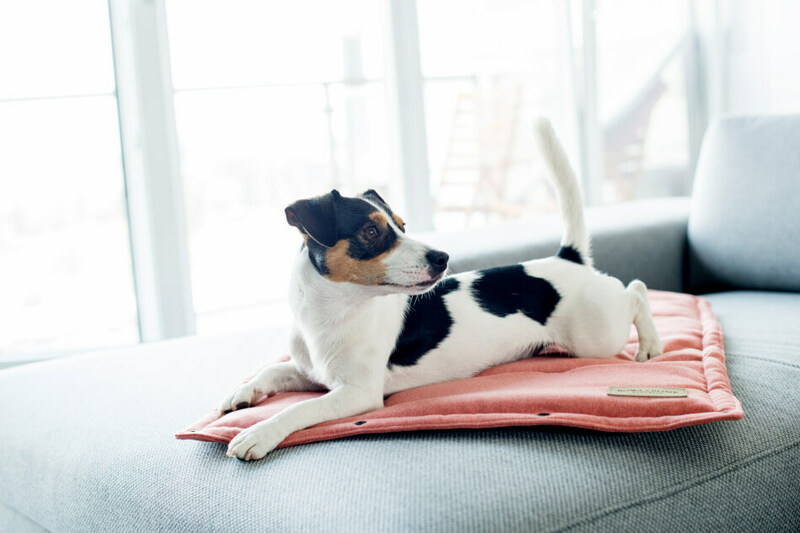 During your visit to the veterinary clinic, you can encourage your dog by taking his favourite toy or blanket. 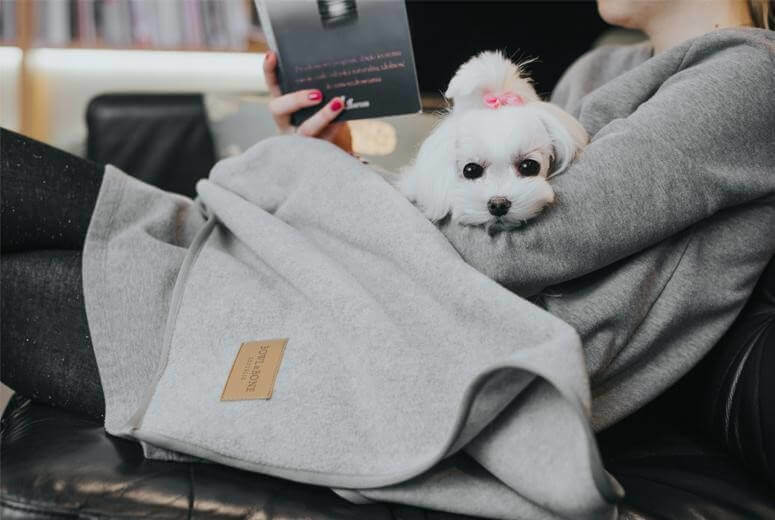 Having a familiar object with a comforting scent will soothe your dog’s nerves and give him a sense of peace and security. If you are going to a clinic just to have a discussion with a vet and ask a few questions, it is worthwhile to consider leaving your dog at home. 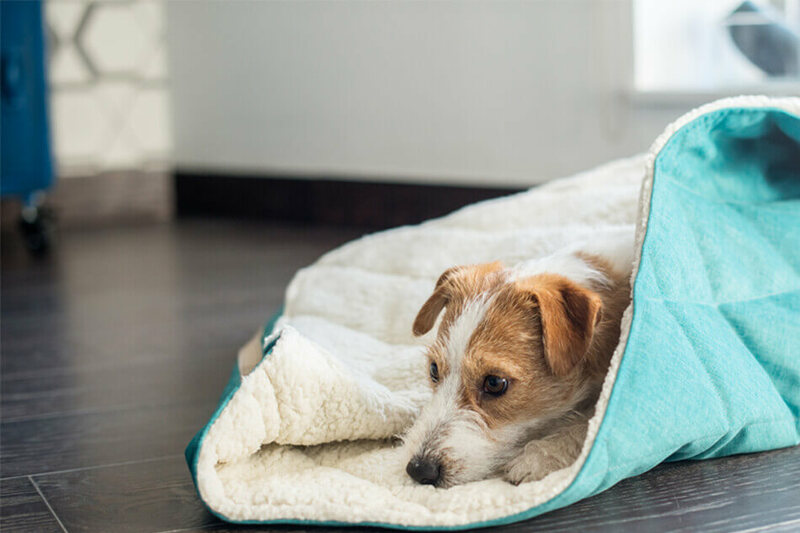 By doing this, you will avoid unnecessary stress for your dog by letting him stay at home and calmly rest in his dog bed. Your first visit to the vet is exceptional, both for you as the carer and for your beloved pup. The main task of the doctor during your dog’s first vet appointment will be to assess your pooch’s development and overall state of health. In evaluating your dog’s health, assess your dog’s fur. Both its condition and whether or not it is carrying unwanted parasites. During the doctor’s evaluation, it is also necessary for him to look at your dog’s teeth and ears. Furthermore, your dog’s paws and claws should also be checked. This is especially important for puppies. The pads of their feet are not always hard enough yet to protect them from injury. If your dog has not been dewormed before going to the vet, the doctor will administer the necessary medicine. If it’s not possible – because of other treatment – he will arranges a separate visit for this purpose. Your first visit to a veterinary clinic is the best time to discuss a plan for future vaccinations. It is worth asking your vet about any additional vaccinations that they recommend, as well as, the frequency with which these shots must be repeated. Before vaccinations, make sure that your dog has been dewormed. This is a necessity. If your vet proposes to carry out a vaccination without first checking if your dog has been dewormed, ask them to check this immediately. When you visit a veterinary clinic, you should remember to ask your doctor some important questions. Preparing for the conversation with your doctor will help facilitate a smooth visit. One of the most important issues to discuss with your vet is a vaccination and deworming schedule. This is especially important for puppies. Puppies’ immune systems are not yet fully developed, and this makes them more susceptible to infection. Depending on the season, your dog will need protection from ticks, fleas and other parasites. Ask your vet how to protect your dog in the best way possible. Ask for a prescription and the specific dosage of a medication that is perfectly suited to your dog. Your first visit to the vet is the perfect moment to check your dog’s basic parameters. Ask your doctor if your dog’s bodyweight is healthy. In the event that your dog is over or under weight, ask for help to create a proper diet for him. If you suspect that your pup has a food allergy, consult this with your vet. Ask about the state of your dog’s gums and the teeth. If the veterinarian notices the onset of disease, ask him about the best ways to improve your beloved companion’s oral hygiene. It is advisable that your vet should perform at least basic check-ups as part of your dog’s prophylaxis. Ask your vet what he recommends for your pet and what the costs are. This is especially important if your dog is at risk of developing diseases that are common in a given breed. If you have any doubts about the health of your dog, or you have noticed alarming signals, be sure to discuss this with your vet. Perhaps this is just a false alarm and you do not have to worry about it. That being said, if the problem turns out to be serious, a quick reaction may prove invaluable in the fight against disease. Above all, do not forget that no matter how brave your dog is, he will always need you to give him a sense of calm and security. When visiting the vet, make sure your dog knows that you will be by his side the whole time. Show him your love and care –he will return it a thousand times over.